Consulting can be a lifestyle business, but people who use that as a criticism may be hiding their own insecurities by pushing them on you. So you’re looking to set up a personalized email address, website or blog. 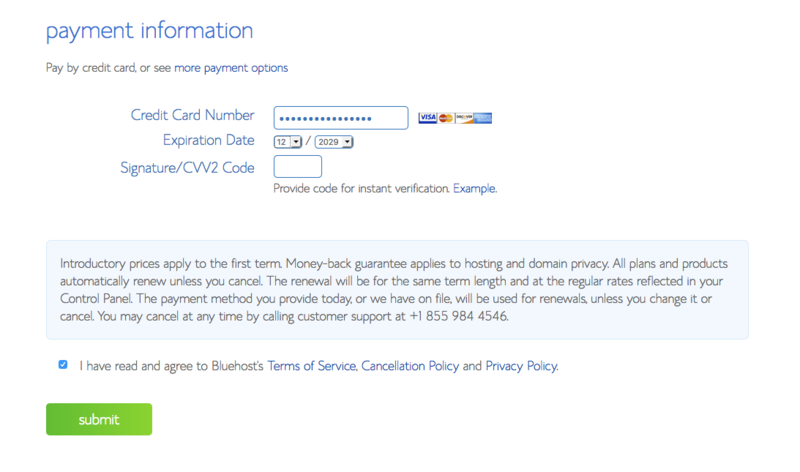 I’m a Bluehost affiliate partner and I want to be clear that I receive a commission if you sign up with them. You are certainly welcome to set up a website, blog or personalized email anywhere. I spent a fair bit of time researching where to send Consultant Journal readers, though, and I chose Bluehost because they’ve been around the block, they’re a recognized name and their approach seems good. I’ll walk you through the steps. 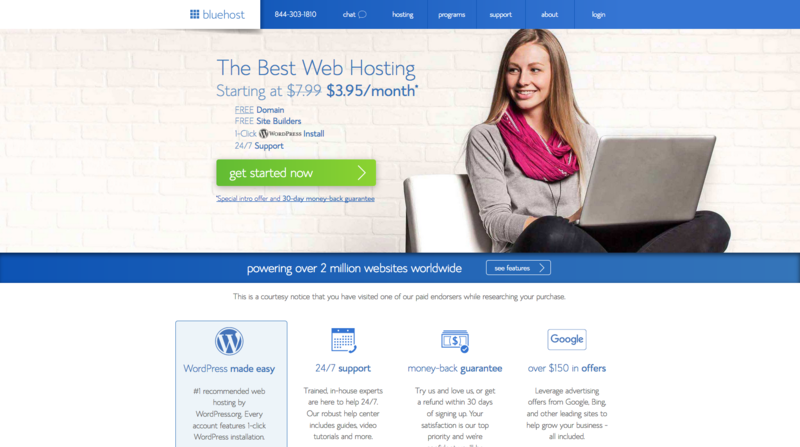 Click here to go to the Bluehost website (it will open in a new window). Got it? Good. I am a big WordPress fan and I find it’s pretty easy for most people to set up, so I suggest going with that. I’m a bit of a klutz, so I like having a backup for my websites. You can choose any of these plans, but I personally feel most comfortable with one that comes with a site backup, so that I can recover anything I lose. However, when I was starting out, I used to just keep copies of my stuff in a folder saved in the cloud. If you’re just going to have a few pages, you can start that way. However, think about whether you also want domain privacy. I also pay the extra for my sites to have my registration details kept private, so that I don’t end up with someone showing up at my office or home unannounced, except for the courier folks who bring my chocolate subscription! Okay. So click the plan you want. There are lots of places you can buy domain names and you’re certainly welcome to choose one from your vendor of choice. 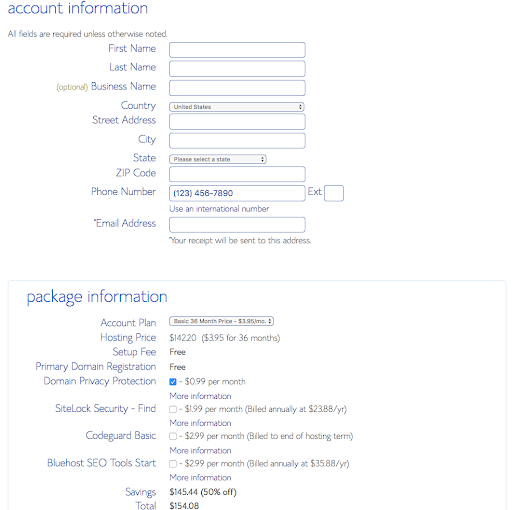 Bluehost includes a free domain with your registration setup, though, so you might want to stick with them and keep it simple. If you’re choosing a domain name, I recommend going for something short and sweet. I’m a bit biased to .com domains, but it’s fine to look at other options. With so many people just relying on search engines and links, you have a bit more flexibility these days. Still, I prefer to find something short and easy to spell, pronounce and remember. I also suggest making sure you aren’t infringing on any trademarks or existing business names. You may want to try using the domain suggestion tool to find something, if your preferred options are taken. Make your choice and click next. Depending on what you chose, you’ll either be on to your domain naming or the payment details. Then choose your package. (It’s okay to choose the shortest time frame. You don’t have to go for three years and, although, as a partner, you might think I’d push you to go for the longest term, I suggest you just do a shorter term, so that you get a taste of what’s happening.) You can’t pay by the month, but you can choose a 1, 2, 3 or 5-year package that works out to a decent monthly amount. When I set up website, I click the domain privacy protection button. I don’t like my personal details out there for anyone to find. If you happen to work from home, it’s especially important that you consider a privacy plan – it doesn’t add very much and it keeps your address and other details private. Otherwise, just ignore all the special offers and details. And there you go. You’re done. Okay. You’re all set up. You can set up your email, website or blog now. Go check out your new domain – and don’t be surprised when you see it isn’t ready yet. It takes a while for all the new domain and name server info to percolate through the Internet. Give it a day or two. But, in the meantime, you can start building. So, from here, I would just click “I don’t need help.” Okay, I understand. You’re thinking, “BUT I DO NEED HELP!” I get it. It’s just that the options with the blue buttons come with things set up and then you might find you’re trying to undo some of what’s been set up. If you click “I don’t need any help”, you can start from scratch and just set up the way you want. If you’re just doing a blog, you can simply have one page and do everything there. If you’re doing a website, I recommend you do what I teach my university students! Set up the main home index page, About and Contact. From there, you might want to add pages for Blog, Services, Products. Keep it simple. 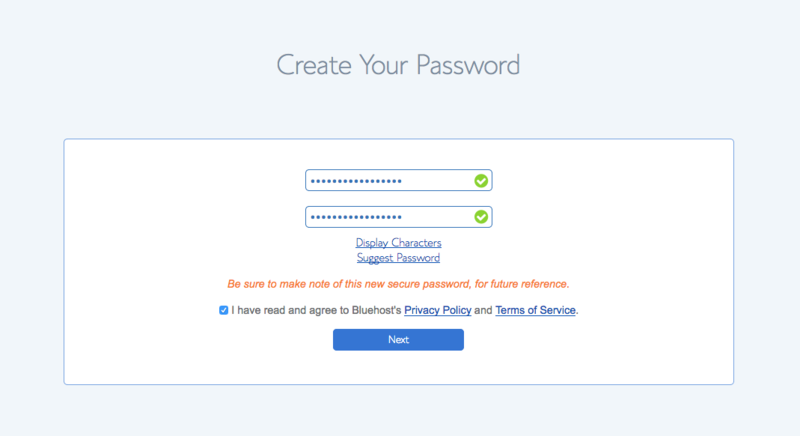 Make sure you’ve activated any account and website links sent to you by Bluehost. 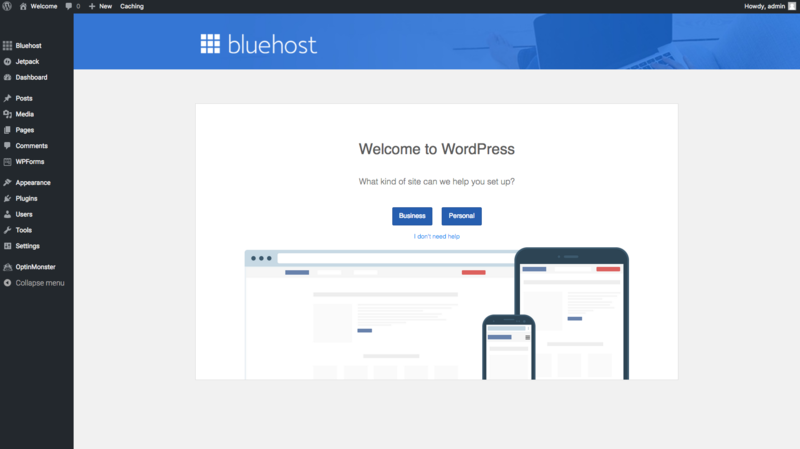 Contact Bluehost at https://www.bluehost.com/contact. Calling usually works better than chatting and, personally, I find I usually connect better with people on the phone, when I can hear their voice. I don’t have your account information! 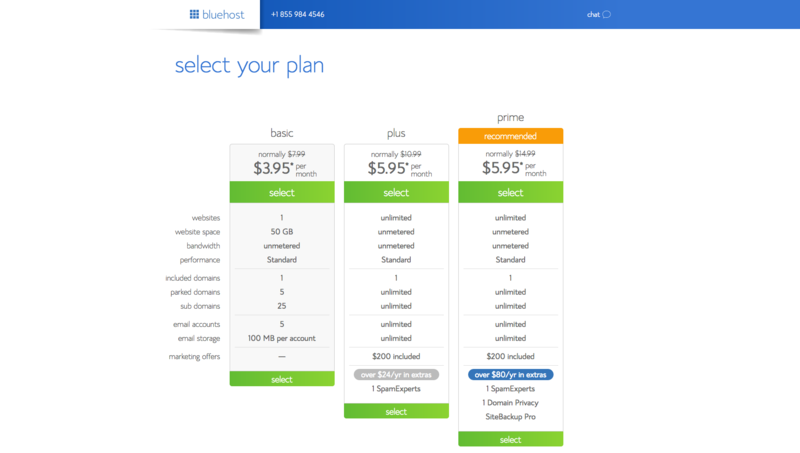 Bluehost has all that and they can help you figure things out. Enjoy your new website or blog! 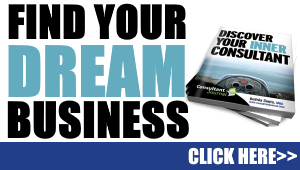 Looking for a way to boost your bottom line? Taking steps to reduce client churn – account turnover – can help. Maintaining a strong relationship with existing clients and past clients offers an opportunity to improve efficiency and revenues. 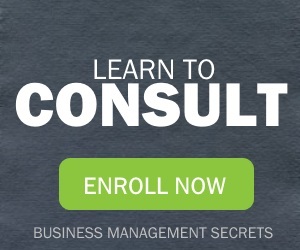 Client churn or loss of customers can be a critical situation for any business. When you face turnover from even a small percentage of clients, it can reduce your revenue and tie up valuable resources as you try to recover. It can also affect your reputation. Fortunately, by taking time to understand causes of client churn, you can figure out what causes clients to turnover – and what you can do about it. Trust forms the base of customer relationships. Focus on clients most likely to be a good fit. If your client feels that you are not being honest in your dealings, they may stop engaging or returning and may even start telling others to do the same. Strive to build a culture of trust with clients. Be honest, predictable and reliable. Every client has individual needs, wants and expectations. By working with the client to understand their unique situation, you can help them build a vision to overcoming problems and finding solutions. As part of that, you need to position your services and products as key, without pushing anything on the client. If a client feels that there’s a lack of fit and that you’re not meeting their expectations, they won’t want to come back. By taking the time to build relationships, you can better set client expectations. Let them know when you can and can’t help – and work with them to find solutions, even if you need to refer them to others to create a complete solution. Focus on delivering high quality services and products that align with your client’s needs and expectations. Wherever possible, under promise and over deliver. Your current clients can amplify your brand. They not only may continue to buy – they can influence others to buy from you. Create a marketing campaign focused on your current clients. Since you’ve already done the hard work of winning them over, it should be less work to convince them to buy again than to find new clients. Remind them why they sought you out, what successes they have and how they can continue working with you. You can also create a referral program to encourage them to use word-of-mouth to market your business. In the age of globalization and online services, clients can easily move to new providers. But, by building a relationship that delivers a superior customer experience, you can help retain them – and make changing providers feel like a bigger risk. Listen to each clients’ needs and encourage them to give you feedback. Rather than getting caught up in conflict, look for opportunities to meet complaints, better explain options and even cross-sell your products and services. Clients prefer to work with providers who value their input and their experiences – so set up a feedback system and a way for responding. Look for opportunities to communicate how you’re responding to feedback and continuing to innovate. Create loyalty programs for clients to reduce churn and turnover. While that might make you think of a little card that your local coffee shop stamps each time you buy a coffee, this concept can scale up to even Fortune 500 firms. You can offer discounts, rewards and incentives for frequency of purchase, length of relationship, referrals, variety of services and products used and more. Sometimes, even a card or email that thanks a client for their ongoing business can make a difference, without requiring you to cut your fees. While any business will face some client churn, successful businesses look at client turnover and make plans for addressing it. What steps do you take? 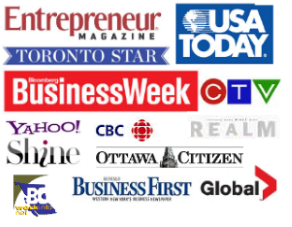 Recently, several readers have contacted me to say that they aren’t sure how to convince clients of their value. They note they’re new to the field and that they don’t know where to go from there. 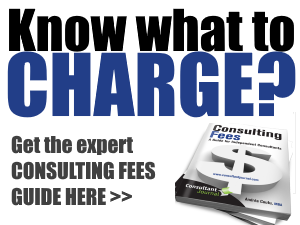 So how do you figure out a consulting fee when you’re an upstart consultant or firm? Writing consulting proposals? Check out this post for tips on sections to include. CPD for BC CPA members – learn about verifiable & unverifiable CPD (continuing professional development) for BC Chartered Professional Accountants. Faced with professional demands for continuing professional development, busy practitioners, consultants and business owners are turning to both online CPD and traditional training options. Looking to set up your Twitter account? Here’s how to choose a Twitter name, handle or account – and what to do if the name you want is taken.